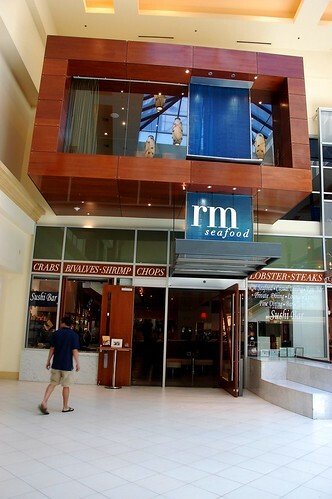 While walking through Mandalay Bay, we happened upon RM Seafood and decided to give it a try. 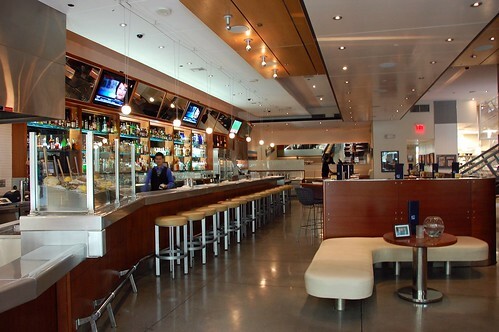 It was pretty early in the day, so the place was sort of dead. That worried me a little, but, after reading some of the literature posted at the front of the restaurant, I felt good about our choice. 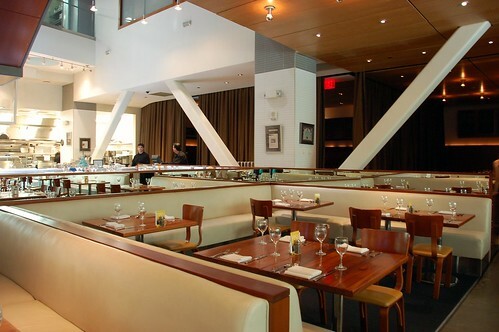 It turned out this was Top Chef Masters contestant Rick Moonen's restaurant. 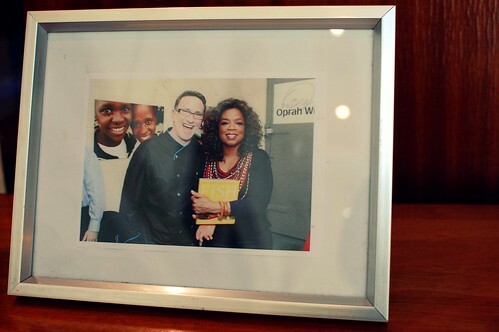 Good enough for Oprah. Good enough for us. The beautiful vast two-story interior enthralled me. Airy and modern yet comfortable. I even caught a glimpse of Chef Moonen himself while I was on a staircase. I snapped when we both least expected it. Yay for a look of surprise and a shot of blur. 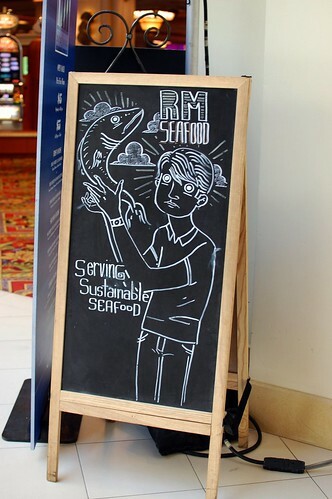 According to its website, RM Seafood is "committed to us[ing] organically grown sustainable produce and sustainably caught seafood." The menu certainly reflects this mission. 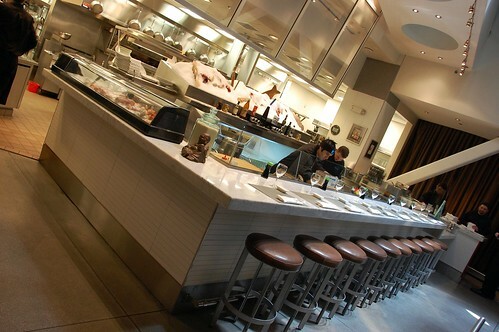 Lunch options are seasonal, simple, well-prepared, and well-priced. We had a grand time with the place nearly all to ourselves for much of our meal. 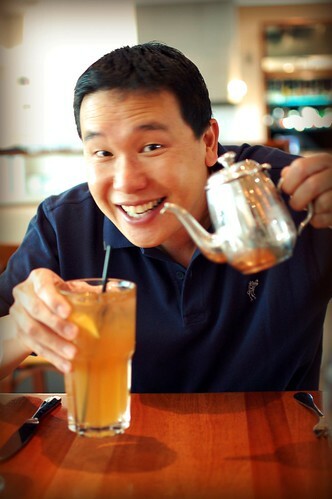 If you order an Arnold Palmer, you get a personal chilled tea kettle. Creamy white clam chowder, bacon, littleneck clams, potatoes, dill ($6). Quite the lovely rendition of a classic. Lots and lots and lots of meaty clams. Great flavor. And no filler -- you won't get a mouthful of flour here. Just a mouthful of delicious! 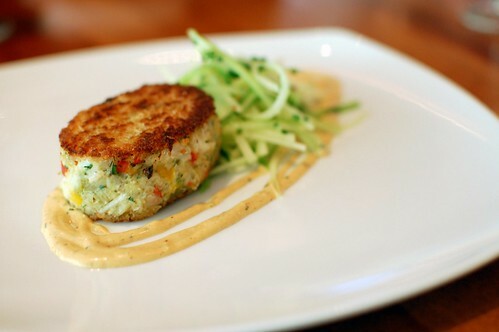 Jumbo lump crab cake, chipotle, cucumber, pickled green papaya ($16). Damn good. Again, no filler here. While the crab cake stole my heart and totally overshadowed the papaya, I have to give a little shout-out to the crunchy green shreds. Nice tangy partners for the crabulous star of the plate. 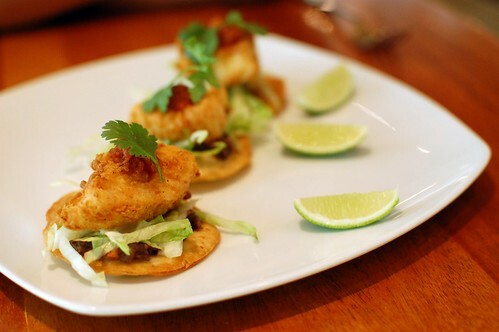 Fried halibut tostada, housemade flour tortilla, avocado cream, charred salsa ($18). Definitely fresh. Definitely enjoyable. Definitely too tiny! Sadly, this wasn't worth its price because it was only three bites! Catfish sloppy joe, potato chips, pickle, soft potato roll ($11). This ain't your school cafeteria's sloppy joe. Loved this sandwich. Loved the fries. Both were crunchy, golden, and wondrous. Stuff doesn't need to be fancy to be yummy! Since our visit, I've spoken to a number of people who were underwhelmed by their dinner experiences here. As you can see, however, our lunch didn't disappoint. Next: Prix fixe with a Michelin star. doesn't he look a lot like rick bayless? i was confused when he showed up on top chef masters at first. 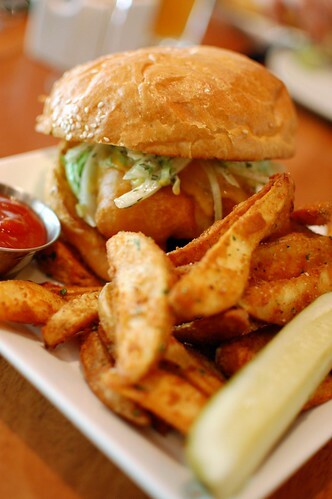 That catfish sandwich looks sooo good! 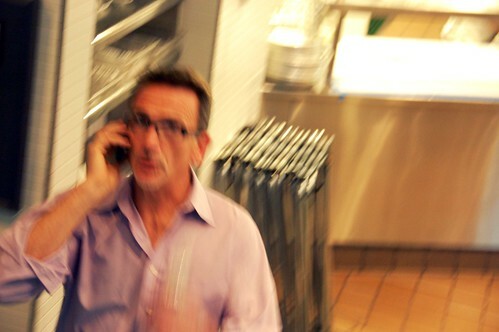 I love how you're stalker-like and snapped a picture of the chef. ooohhh we do need a good lunch place......your timing on these is SO helpful! I thought he looked like rick bayless, too. that lunch looks way yum. I tried to chew on the sloppy joe via my monitor. Is that normal? God somebody gimme some food! 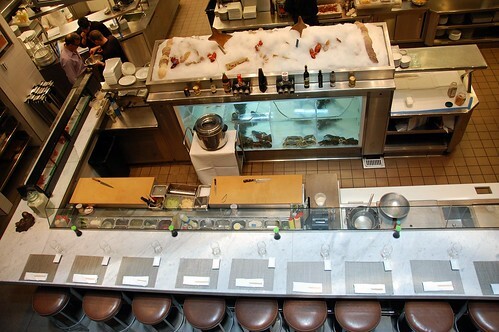 Serving sustainable seafood in the middle of a desert is pretty funny. Love the look of surprise on the chef's face. My bff that lives in Vegas has been and has only lovely things to say about the restaurant. Her and her husband are foodies and are slowly making their way through all of the Vegas hotspots, so I tend to trust her opinions of places. oh man, i want crab cakes now. We went there for dinner when we were there for our anniversary and we loved it! Nothing but good things from us! Very nice! 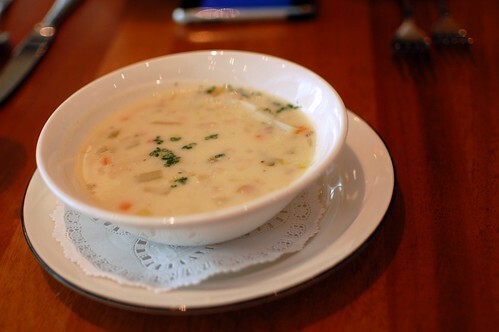 I'm surprised the clam chowder was so inexpensive. Gotta love the Mr. M shots. He's so friggin cute. Nice! 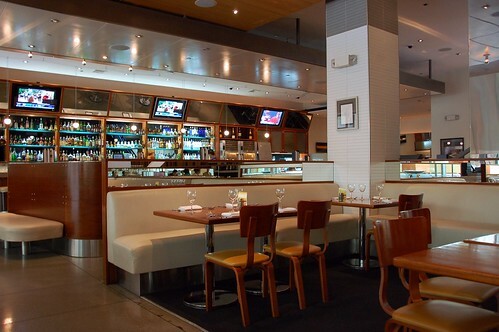 Looks like a great place for lunch in Vegas. I particularly like the pictures of Mr. Monkey and the crabcake. They look so nice and professional :). i'm trying to be less of a pig lately. reading your blog never helps. i need to go and do his ice cream tasting thingy.